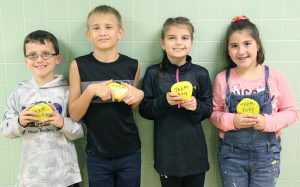 Leighton fourth graders, from left: Owen Bartlett, Vaughn Thingvoll, Grace St. Onge and Reagan Wood show off their kindness rocks, painted in honor of former Leighton Elementary student Riley Delles who was recently diagnosed with leukemia. OSWEGO – Once a Buc, always a Buc. That sentiment has remained true for former Oswego City School District student Riley Delles who was diagnosed with leukemia over the summer, three weeks after moving out of state. Her former Leighton Elementary School community, which she was a part of from pre-kindergarten through grade four, has rallied around their friend to support both her and her family through Riley’s health struggles. Fourth grade teacher Jessica Leonard described her former student as “an amazingly smart, kind, intelligent, funny little girl who was a friend to all” who also has embodied kindness and compassion. Leonard said Riley was thrilled to find colorfully painted kindness rocks throughout the community and enjoyed visiting Leighton’s kindness rock garden. 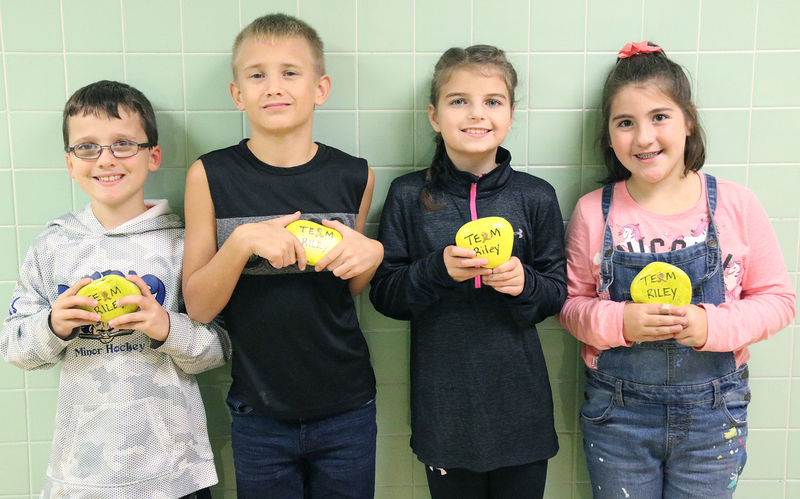 In support of Riley and her love of kindness, Leonard’s current fourth grade class painted rocks golden yellow in honor of September as National Childhood Cancer Awareness Month. Each rock had “Team Riley” painted on it, with the A in team replaced with a golden childhood cancer awareness ribbon. Leonard then hid the rocks throughout the Oswego community, in hopes of raising awareness. Several Leighton fifth graders, who would have been Riley’s classmates this school year, wrote encouragement letters and let her know they miss her. Leighton staff members also have been supportive and sent a box of gifts to cheer up their forever friend. Leonard said the family was appreciative and thanked both the Leighton and Oswego communities for their continued support. The effort, she said, has also tied into the district’s character education development and lessons related to OCSD’s Leader in Me initiative.